The things that pop into my mind when I think of New Orleans are jazz, Mardi Gras, and Voodoo. I had the chance to experience Mardi Gras over twenty years ago and Jazz Fest fifteen years ago, so the only thing left on my list of unique things I must do in New Orleans was a Voodoo tour. 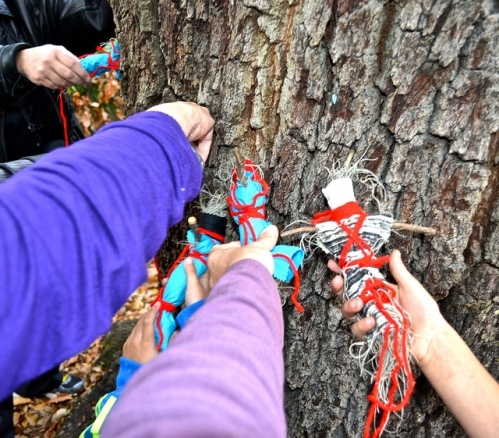 I know that there are a lot of misconceptions out there about Voodoo, but I wanted to learn firsthand the real info about this mysterious religion and practice. But I must confess I was a bit hesitant about signing up for one of these tours with my kids. I have a preschooler and know that any tour that lasts over 30 minutes is a challenge. 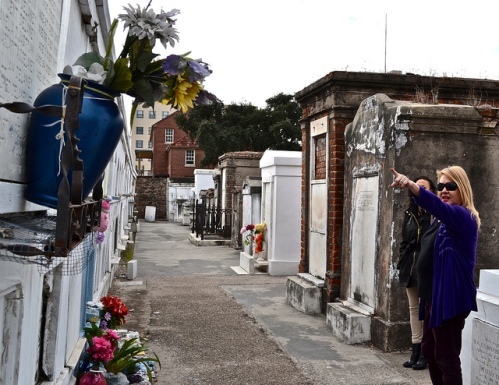 However, after talking to Mary, the owner and main tour guide, we decided that a day tour that included a visit to the cemeteries and then having a Voodoo doll workshop would be the best bet for younger kids because it is so dynamic. She also offered to take us in her van so the kids didn’t have to walk too much. Before I dive in and share details about the tour, I will mention that Mary is super knowledgeable and you can tell that this is truly her passion. During our tour we got to see a few guides from other companies who were even dressed as Voodoo characters, but listening to them was almost like gibberish. To me, finding a good guide, knowing that you will leave with a good grasp of the history and true understanding, is essential. • Louisiana Voodoo is also known as New Orleans Voodoo. • The name describes a set of spiritual folkways which originated from the traditions of the African diaspora. • It is a cultural variation of the Afro-American religions developed by French, Spanish, and Creole population that came to live in the U.S. state of Louisiana. • Voodoo became syncretized with the Catholic and Francophone culture of south Louisiana as a result of Creolization in the region. • The Ouanga is an important component of the Louisiana Voodoo. It is a charm used to poison an enemy and contained the toxic roots of the figuier maudit tree, brought from Africa. • Another component of Louisiana Voodoo brought from West Africa was the veneration of ancestors and the subsequent emphasis on respect for elders. • Someone who practices Voodoo is often accused (especially by Hollywood) of being a person who orders the spirits to do their bidding. However Voodoo practitioners see themselves as servants of the spirits. • Their knowledge of herbs, poisons, and the creation of charms and amulets, intended to protect oneself or harm others, are key elements of Louisiana Voodoo. • Voodoo was brought to French Louisiana during the colonial period by workers and slaves from West Africa. • During the 19th century, Voodoo queens became central figures to Voodoo in the United States. • They presided over many of the ceremonial meetings and ritual dances. • Voodoo queens earned an income by administering charms, amulets, and magical powders guaranteed to cure ailments, grant desires, and confound or destroy one’s enemies. • Her influence facilitated the adoption of Catholic practices into the Voodoo belief system. • Doctor John, also known as Bayou John and Prince John, was one of the most prominent Voodoo kings in New Orleans. • During the 1930’s, true Voodoo went underground as New Orleans became an increasingly popular tourist destination. • Voodoo both fascinated and repelled the white New Orleanians. But they still came to watch the public rites that were held in Congo Square (where Armstrong Park is today). • Voodoo acquired an exotic, Hollywood image in the 1932 film White Zombie. • In the early 21st century, Voodoo has become a major tourist attraction in New Orleans. 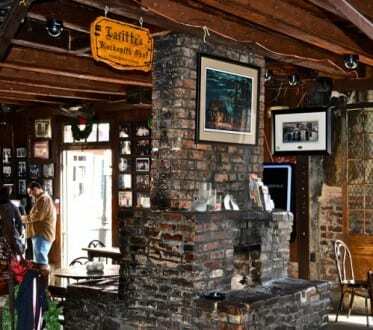 The meeting spot for Bloody Mary’s Tour, where our adventure started, was Lafitte’s Blacksmith Shop Bar. • Lafitte’s Blacksmith Shop was built between 1722 and 1732 by Nicolas Touze. • It is said to be the oldest building used as a bar in the United States. • Between 1772 and 1791, the property is believed to have been used by the Lafitte Brothers as a base for their Barataria smuggling operation. • The building underwent two great fires at the turn of the 19th Century, due to slate roofing, and survived. Our next stop was the historic Saint Louis Cemetery No. 1. I knew that it was quite well known in the area but I had no idea about how important the cemeteries in this city are, specially this one. If you come to New Orleans this is a must-do attraction, but be sure to bring along a knowledgeable guide. • It was established in the late 1700′s. • St. Louis Cemetery No. 1 is the oldest cemetery in New Orleans and is still the site of several burials a year. • At first St. Louis Cemetery No. 1 was divided into sections for Catholics, non-Catholics, and “Negroes,” (possibly referring to slaves). Gens de Couleur Libres were buried according to their religion. • New Orleans’ location on swampy, below sea level terrain made any high ground extremely valuable for the living so a swampy site was chosen on St. Louis Street. • By the late eighteenth century, the cemetery for the city, St. Peter Street, had begun to fill up, and the town development had reached its boundaries. • On August 14, 1789, a new cemetery was created by Spanish Royal Decree. • The new cemetery was placed 40 yards behind the Charity Hospital (on Rampart Street between Toulouse and St. Peter Streets). • In 1796, a canal was installed next to the cemetery for the purpose of transporting goods as well as draining the swamp around the city. • Initial burials appear to have taken place in a haphazard manner, leading to the current maze of tombs and aisles. • Due to its location in a swamp, St. Louis Cemetery No. 1 was constantly threatened by flooding. To combat the rising waters, sand and shells were continuously added to the site. • In 1816, the waters of Macarty Crevasse flooded the cemetery. The site was closed and burials took place across the river. • By the early nineteenth century, New Orleans had grown, and the City wished to extend Tremé Street, the Protestant Section, was in the way. • In 1822 the City proffered a site in the Faubourg St. Marie to be used as a Protestant burial ground, later known as Girod Street Cemetery. • Around the same time in 1823, the City created St. Louis Cemetery No. 2, even further removed from the city center. • St. Louis Cemetery No. 1 remained in operation, but the more ornate tombs of the Creoles and the Benevolent Societies were being constructed in St. Louis Cemetery No. 2. • Further city development resulted in the shrinking of St. Louis Cemetery No. 1. It is now significantly smaller than its original size. • Significant changes started taking place to the area surrounding St. Louis Cemetery No. 1 in the mid-twentieth century. • Scenes for the movies Cincinnati Kid (1965) and Easy Rider (1969) were filmed in the St. Louis cemeteries. • After the release of Easy Rider, the Archdiocese enacted a policy of disallowing any filming in its cemeteries, except in the case of pre-approved documentaries and educational films. • Her full name was Marie Catherine Laveau. • She lived between September 10, 1801 and June 16, 1881. • On June 16, 1881, The Daily Picayune, according to “Voodoo in New Orleans” by Robert Tallant, announced that Marie Laveau had died peacefully in her home. • According to official New Orleans vital records, a certain Marie Glapion Lavau died on June 15, 1881, aged 98. • However people claimed to have seen her in town after her supposed demise. • She was a Creole practitioner of Voodoo renowned in New Orleans. • Historical records surmise that Marie Laveau was born free in the French Quarter of New Orleans, Louisiana. • On August 4, 1819, she married Jacques Paris, a free person of color from Haiti. • Jacques Paris died in 1820 inside the attic/torture chamber of Delphine LaLaurie. • The only record of any sort of occupation she had was as a liquor importer in 1832 on Dauphine Street. • Folklore says at one time she was also a hairdresser. • She took a lover called Christophe Dominick Duminy de Glapion, with whom she lived until his death in 1835. • They were reported to have had 15 children, including Marie Laveau II, born c. 1827, who sometimes used the surname “Paris” after her mother’s first husband. • Some scholars believe that the mother was more powerful while the daughter arranged more elaborate public events. • In 1874 as many as twelve thousand spectators, both black and white, went to the shores of Lake Pontchartrain to see Marie Laveau II performing her legendary rites on St. John’s Eve. • Marie Laveau is generally believed to have been buried in plot 347, the Glapion family crypt, in Saint Louis Cemetery No. 1 in New Orleans. • Some believe that if you want Laveau to grant you a wish you have to draw an “X” on the tomb, turn around three times, knock on the tomb and yell out your wish. If it is granted, come back, circle their “X,” and leave an offering. • The tomb in Saint Louis Cemetery No. 1 was vandalized on December 17, 2013. • Although some references to Marie Laveau in popular culture refer to her as a “witch”, she is properly described as a ‘Voodoo priestess’. Out last stop was Armstrong Park. This is where we got to create our very own Voodoo dolls. Quick fun fact about Armstrong Park – Congo Square (in the heart of the park) was where the slaves back in the 19th century used to come to sing, dance and drum in authentic African style. That tradition slowly turned into the roots of New Orlean’s unique music traditions and Jazz. This was where all of the fun started for my boys. The tour was a bit lengthy for them. But making Voodoo dolls felt like a reward. Once they were finished Mary blessed the dolls for us.